Life is short, but snakes are long: How many snakes are venomous and how many are constrictors? How many snakes are venomous and how many are constrictors? I applied it to all others in the absence of specific data for those species. Many people are aware that some snakes constrict their prey, and others use venom to kill their prey. Recently, somebody asked me what the breakdown was, and I had to admit that I didn't know exactly. 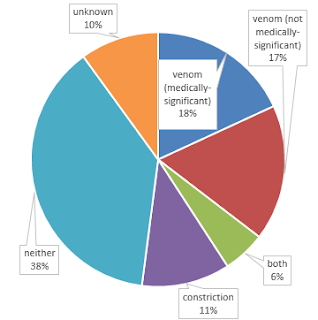 My initial estimate was that 20% were venomous in a way that is medically-significant to humans, and that probably a similar number of species are opisthoglyphs that use venom that is not life-threatening to humans to subdue their prey (with a decent number of these pending discovery, confirmation, or further investigation). Estimating the percentage of constrictors was more difficult, but I suspected that it was no more than the percentage of snake species that use venom, and probably somewhat less. A lot of people don't realize that there is a huge third category of snakes that just seize their prey and swallow it alive, sometimes subduing it first by crushing it with strong jaws or pinning it to the ground with a coil (which hardly counts as constriction but could be an evolutionary precursor). This inspired me to do some literature searching, and as I suspected nobody has ever attempted to estimate the exact percentages of snake species that use each kind of prey-killing behavior. As such, I have prepared a preliminary analysis, the full contents of which I intend to make publicly available after peer review. I hope that doing so will stimulate others to publish their observations of feeding behavior in poorly-known snakes (of which there are many), and add to the long history of discussion about the evolution of snake feeding modes, most of which took place before we had a solid grasp on the evolutionary relationships of extant snake families. I found that the answer to this question is not as simple as it may seem. Many snakes unambiguously use venom or constriction, but many use neither, and some use both! Of course the data are not as detailed or abundant as we would like. What follows is a break-down of the categories I used, and some interesting exceptions that I uncovered. Boas: 61 species, including the eponymous Neotropical Boa constrictor, anacondas (Eunectes), and smaller tree and rainbow boas (Corallus, Epicrates, Chilabothrus) as well as several (sub)families of booid snakes from various and sundry locations around the world—Candoia from New Guinea and Melanesia, sand boas (Eryx) from northeast Africa, the Middle East, and southwestern Asia, Charina and Lichanura from North America, Ungaliophis and Exiliboa from Central America, Acrantophis and Sanzinia from Madagascar, and Calabaria from tropical west-central Africa. 26 species of Old World Elaphe and their relatives in the genera Zamenis, Orthriophis, Oreocryptophis, Euprepiophis, and Archelaphe. These groups of snakes vary considerably in how often they employ constriction to kill their prey. Some probably use it almost all the time (although even ratsnakes eat prey that they don't constrict, such as bird eggs), whereas others use constriction only rarely, when encountering an unusually large or dangerous prey item relative to their size and strength (for example, one study showed that species of Python, Boa, Pantherophis, and Lampropeltis always constricted mice if they were at least 90% the diameter of the snake's head). Some, such as Regina alleni and Acrochordus filesnakes, may use constriction more so to immobilize the prey than to kill it/it probably doesn’t work that well under water (although Wandering Gartersnakes usually killed mice before eating them). 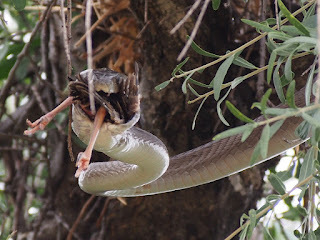 It seems that mammal-eating is a driver of the evolution of constriction in many cases: species that eat mammals are the only members of their genera/families that use constriction (Thamnophis elegans, Boiga irregularis, Lamprophis/Boaedon, some members of the Oxyrhopus/Clelia/Pseudoboa clade) and both these and species that are nested within mammal-eating clades but have shifted to other prey (Lampropeltis extenuatum, Elaphe quadrivirgata, Cemophora coccinea1) tend to have more variable, less efficient constricting behavior that is generally only used to immobilize rather than to kill prey, if it is used at all. 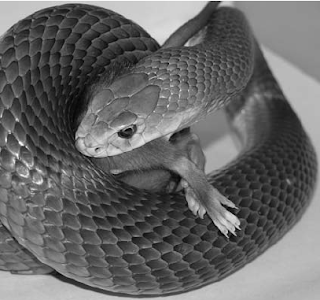 As Alan de Queiroz and Rebecca Groen put it: “Thamnophis elegans are not finely tuned constricting machines” and “Numerous trials in which a garter snake, holding a mouse in its jaws, was chaotically thrown about by the prey's movements support our interpretation that long constriction latencies do not reflect adaptive plasticity in T. elegans.”. Constriction probably functions to reduce the cost of feeding in terms of time, energy, and/or the probability that the prey will harm the snake. Conspicuously not in this category, we have the poorly-named and misleading North American Racer, Coluber constrictor, which is not a constrictor (thanks for nothing, Linnaeus). and probably many more. It's actually possible that this is the largest group, because some of the "unknown" and "neither" species probably actually belong here. An interesting exception are Turtle-headed Seasnakes (Emydocephalus annulatus) and Beaded Seasnakes (Aipysurus eydouxii), which eat fish eggs and have mostly lost their venom, fangs, and venom glands. Another example of a reduction in fangs are some fossorial species of Tantilla, which have only slightly enlarged and faintly grooved rear maxillary teeth, in contrast to the more well-developed rear fangs of most other members of this large genus. These snakes appear to specialize on beetle larvae rather than on centipedes, although no one has looked to see if their venom is any different as a result. Some of the aforementioned goo-eaters do use their coils to support the shells of snails while they pry out the soft innards. Dipsas coils around the snail’s shell and Sibynomorphus use as s-shaped loop of their body to support the shell, whereas some Sibon crawl backward through crevices to wedge snails into them, providing an anchor against which they use their body muscles to pull out the soft parts. Finally, there are some really interesting examples of snakes that use both venom and constriction to subdue their prey, although not always at the same time. Perhaps most impressive but least well-documented in the scientific literature are two viper species that sometimes use constriction in conjunction with venom: Ovophis monticola and O. okinavensis2. A review by Rick Shine & Terry Schwaner brought together data on numerous Australian elapids that, although they clearly have and use venom, also use their coils to subdue and hold prey while envenoming it. In many of these species, including tiger snakes (Notechis), brown snakes (Pseudonaja), curl/myall snakes (Suta), whip snakes (Demansia), Australian coral snakes (Simoselaps), crowned snakes (Cacophis), and olive seasnakes (Aipysurus laevis), the coils are not used alone as the primary method of prey subjugation, and one recent paper suggested that we think of them as "part of a 'combined arsenal' of prey subjugation strategies". even Wandering Gartersnakes (Thamnophis elegans)—sometimes! 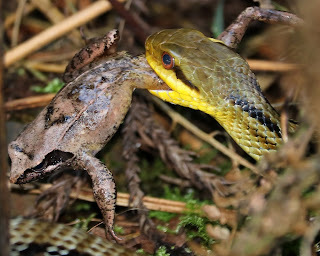 This generalization is supported by observations showing that mammals tend to be killed by constriction prior to being swallowed more often than prey such as frogs, and that larger prey tend to be killed by constriction first, then swallowed. Evidently the amount of struggling is one cue used by Thamnophis elegans to decide whether or not to constrict prey. Experiments carried out by Akira Mori and others have shown that "the degree of such behavioral flexibility is, to some extent, species-specific, and it has been suggested that dietary specialists change their behavior more efficiently than dietary generalists, especially when they are young". After my initial pass at collecting these data (during which I made several sweeping assumptions, some of which later turned out to be oversimplifications), I was left with 36% of species unknown. Following a more thorough literature search, I managed to get this down to 10%, which is still 363 species of snakes. In many cases I made assumptions based on generalizations about the biology of groups of snakes—for instance, I assumed that all scolecophidians use neither constriction nor venom, that all vipers use venom, and so forth. But many dipsadine and colubrine colubrids, and many lamprophiids have not been directly studied, and I could find no reports in the literature about their feeding habits. In some cases we don't even know what they eat, and ecological diversity in these groups is very high, such that there are few consistent patterns that I could use to infer prey subjugation mode for these 370 species. Teach yourself about obscure snakes and help fill in the blanks! The most recent similar review was done by Harry Greene in 1994, in which he revised earlier hypotheses he put forth with Gordon Burghardt in the journal Science 16 years before. We now know a lot more about the snake family tree than we did in 1994, particularly the fine details of relationships within the Caenophidia. Overall, the basic pattern has held up rather well—constriction evolved first in basal alethinophidians during the late Cretaceous, accompanying or preceding most other evolutionary innovations that permit snakes to consume large prey, such as kinetic skulls. Greene pointed out that this was before the origin of rodents, often mentioned as potentially relevant to the evolution of snake prey-killing behaviors. Constriction was then lost at least twice—once in uropeltids (which feed underground on earthworms, although I'm not actually aware of any detailed observations of uropeltid feeding behavior) and at least once in basal colubroids, where it might have been at first replaced by venom. 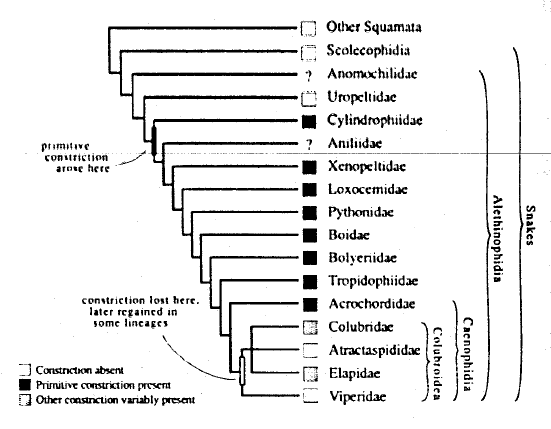 Venom was then subsequently lost in numerous caenophidian lineages, replaced by re-evolution of constriction in some or by other specializations (tooth diastemata for holding skinks, egg-eating) in others, and in some caenophidian lineages snakes use both as appropriate, sometimes together (or they may elect to use neither even if both are available). Both constriction and venom reduce the cost of feeding in terms of time, energy, and/or the probability of the prey harming the snake, but in constricting snakes, everyday locomotion and large prey neutralization are coupled, whereas in venomous snakes they are independent (snakes don't use their fangs to get around). This could be one reason why venom as an evolutionary innovation led to a more speciose radiation of snakes; it's also more susceptible to evolutionary arms races, because prey can evolve resistance to certain venom compounds, but not to constriction. 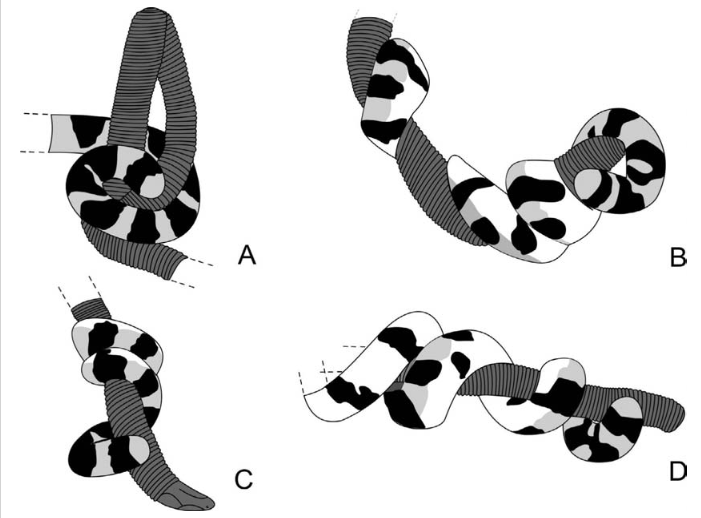 Specialization for constriction is more than just behavior—constricting species also have more vertebrae per unit length than non-constricting species. And there are costs to both, which must be outweighed by the benefits of that defining snake trait: being able to consume prey almost as large, and sometimes much larger, than yourself! Thanks to Karen Morris for asking me this question, and to Alpsdake and Danny Davies for the use of their photos. Gans, C. 1976. Aspects of the biology of uropeltid snakes. Pages 191-204 in A. d. A. Bellairs and C. B. Cox, editors. 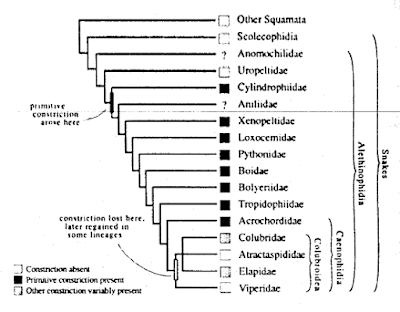 Morphology and Biology of Reptiles. Linnean Society Symposium Series No.3. Academic Press, London. Stettler, P. H. 1959. Zur Lebensweise von Dipsas turgidus (Cope), einer schneckenfressenden Schlange. Aquarien und Terrarien 8:238-241. Can a large reticulated python use constriction in open water? I have read that terrestrial snakes do not constrict in deep water. Is this true? Would this feature--non constricting--make it relatively easy to swim with or catch a large swimming retic? Good question. Anacondas certainly use constriction in the water, and I wouldn't be surprised if other large boas and pythons occasionally did so too. 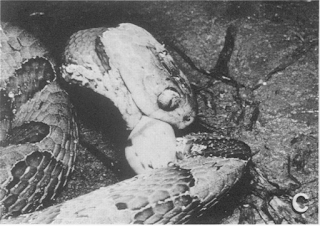 But, in very deep water, it's possible that the snake would either drown or at least be incapable of moving the dead prey back to shore for consumption, since the process of swallowing takes a while and even on land they normally aren't capable of doing much to re-position the constricted, killed prey before starting to swallow it. I would suggest that large boas and pythons at least sometimes also use constriction in self-defense, so that if I were trying to catch one, the last place I would want to be is in deep water. I don't think a large python could hold its breath for long enough to constrict, kill, and eat prey in open water, but I know that they can go without oxygen for far longer than I can, especially if I'm swimming and being constricted at the same time. Thanks. There is a lot to think about there. As usual, animal behavior can be improvisational and surprising when survival is at stake (and when is it not?). Cheers.